Congratulations on the publication of your latest novel. Can you tell us a little about how and why you got into writing novels? I have always enjoyed reading and writing. Growing up, I was always doodling and outlining small “stories.” I never really considered myself a creative writer until my junior year at Marshall University. I was a journalism major and my friend Zack was an English major. He was trying to start a creative writing club and get it sanctioned and recognized as a legitimate club by the university. To do that, he needed members for the club, so he talked me into joining. I was in a group with poets, memoirists, non-fiction writers, etc. I had mostly been honing my skills as a journalist writer for a while, so I felt a bit out of place at first. My senior year, the members of the club agreed that we would write and workshop a piece over the course of the year, and then submit that piece for publication. I wrote a ghost story that was set in the Appalachian mountains. I sent out queries and copies of the story for publication consideration (and this was in the days before Submittable), and a literary journal at Mary Washington College published my story. I have been writing ever since. You’ve written extensively about West Virginia. What do you think is the biggest misconception people have about your home state? That we are uneducated, uncultured rednecks that know nothing and contribute nothing. In fact, West Virginia is no different than any other state. The state has its share of poverty, corrupt politicians, and racial and generation strife between subgroups of its citizens. But you find that in every state. West Virginia is one of the most gorgeous states in the country in terms of scenery and typography, and most of the people that live there are kind, generous, and hard working. Can you describe your main character, Ronan McCullough? Ronan McCullough has spent a great deal of his career as an undercover cop for the Metro Drug Unit of the Charleston Police Department. He is someone that is tough, principled, and loyal. In the first book featuring him as a character (Fragile Brilliance) Ronan is pushed to the limit, physically and emotionally, by a dangerous crime syndicate that has infiltrated Charleston and threatens to destroy the city. Ronan finds himself in that book, and in A KNIFE’S EDGE, caught in the middle of unspeakable violence and surrounded by dangerous men. As a result, he has to take chances and sometimes stretch the limits of proper police protocol to stop the criminals. These are not decisions that he makes flippantly, but Ronan feels like when dealing with criminals that demonstrate a high level of lethality, he has no choice but to do whatever is necessary to stop them. Ronan is also a cop that is undercover in more ways than one. His life is really a tangle of secrets. As a plainclothes operative in Charleston’s Metro Drug Unit, his anonymity is essential. More interesting, he is a closeted gay man who is in love with Ty Andino, a Polynesian-born emergency room nurse that works at Charleston Mercy Hospital. Ronan’s and Ty’s professional and personal lives often cross over and come into conflict with one another in each book. Ronan’s homosexuality is closely guarded from the rest of the department by his investigative partner, Eric Bonamico. 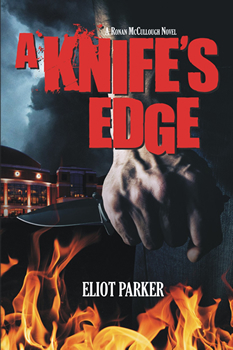 Given that A KNIFE’S EDGE has so many topical elements, I wonder— are you an avid follower of the news? I’m a news junkie, so I do follow the news heavily. In my thriller fiction, I try to create plots that could really happen in contemporary society. Even though all readers must suspend their belief somewhat when reading fiction, I want readers to wonder what might happen in their own community if this type of crime or these types of criminals came in and took over. Do you feel that crime fiction has a role to play in putting a spotlight on social issues, including some of the ones you touch on here like drug use or political corruption? I do. I think all fiction mirrors the time period and the societal norms and cultural mores of the period. In crime fiction, you encounter the same types of people involved in the same types of circumstances that occur in real-life. I think fiction can put a spotlight on some of those issues but examine the issues in new, fresh ways that add perspective to the problem. Substance abuse and political corruption have been a part of our culture for centuries, and giving readers a different way of looking at those problems is what good fiction can do. You’re a teacher of writing and literature. How has teaching influenced your own writing? Teaching has provided me with the opportunities to be a better communicator and writer inside and outside of the classroom. I enjoy learning from and working with my students, many of whom come to my classrooms with their own varied life experiences. Hearing them share their stories and write about them helps me learn more about people and helps me become a more empathetic person. Are there any writing tips that you share with your students that you think are especially useful for beginning writers in general? I tell my students all the time that writing is mostly about thinking. I ask my students to identify how many times over the course of their schooling has someone come up to them and asked, “How long did it take you to write that essay?” Most of them will raise their hand. When I ask them “How many times did someone ask you how much time you spent thinking about that essay before you wrote it?” all of their hands go down. I want my students to see that good writing comes from thinking and from giving your brain the spaces to examine a topic from a variety of perspectives and link their thoughts, ideas, and past experiences to the writing task. Also, I tell my students that writing is like a muscle: don’t use it often, then it gets flabby and sloppy. I structure my classes so that my students are doing some type of writing every class session, even if it’s just for five minutes. I think that is good advice for writers in general as well. Find time every day to write and don’t set arbitrary word counts for the writing session, just write. This is the second book about Ronan McCullough. Can readers expect to see a third? Yes. There is a cliff-hanger at the end of A KNIFE’S EDGE. I have already outlined the third Ronan McCullough book, tentatively titled Curtain Call. Eliot Parker, a native of West Virginia, is the author of four novels. He attended the Bluegrass Writers Studio at Eastern Kentucky University, where he graduated with an M.F.A. in Creative Writing. 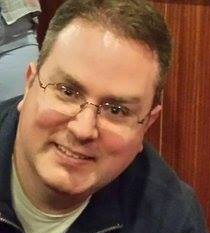 A winner of the West Virginia Literary Merit Award and a finalist for the Southern Book Prize in thriller writing, he teaches writing and literature at Mountwest Community and Technical College. To learn more about Eliot, please visit his website.